In this weekly current affair quiz article, ranges of topics of recent events have been covered. 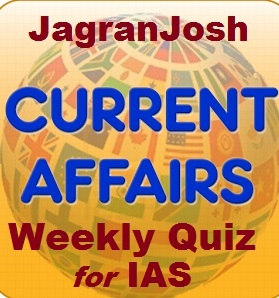 The study current affairs quizzes given in this article provide consistency in coverage of the events happened in the second week of the month of May 2017 which is very important for IAS preparation. Current affair is one of the key sections of IAS Exam and it needs a consistent study with a great thrust during IAS preparation. A better practice of current affairs quiz enhances not only the chances of scoring good marks in IAS Prelims Exam but it also gives an edge to the preparation of IAS Mains Exam. Here, we have compiled the current affairs quizzes created from 6th April to 12th May 2017, crucial for the upcoming IAS Prelims Exam 2017. 2) GSLV basically launches INSAT into the Low Earth Orbit. 3) GSLV-F09 has launched the South Asia Satellite GSAT-9 into a Geosynchronous Transfer Orbit (GTO). The Geosynchronous Satellite Launch Vehicle was primarily developed to launch INSAT class of satellites into Geosynchronous Transfer Orbits. GSLV is being used for launching GSAT series of satellites. GSLV is a three-stage launcher that uses one solid rocket motor stage, one Earth-storable liquid stage and one cryogenic stage. GSLV had launched various communication satellites among which EDUSAT is notable, being India's first satellite built exclusively to serve the educational sector through satellite based distance education. GSLV's primary payloads are INSAT class of communication satellites that operate from geostationary orbits and hence are placed in Geosynchronous Transfer Orbits by GSLV. Further, GSLV's capability of placing up to 5 tonnes in Low Earth Orbits broadens the scope of payloads from heavy satellites to multiple smaller satellites. 1) eVIN (Electronic Vaccine Intelligence Network) is an indigenously developed technology system in India that digitises vaccine stocks. 2) eVIN aims to support the Government of India’s Universal Immunization Programme. 3) The innovative eVIN is presently being implemented across all the states in India. Which of the above statement is correct? eVIN (Electronic Vaccine Intelligence Network) is an indigenously developed technology system in India that digitises vaccine stocks and monitors the temperature of the cold chain through a smartphone application. The innovative eVIN is presently being implemented called across twelve states in India. eVIN aims to support the Government of India’s Universal Immunization Programme. The technological innovation is implemented by the United Nations Development Programme (UNDP). 3. India ranks at 136 in the recent World Press Freedom Index for the year 2017. Which organisation or institute releases this Index? The Press Freedom Index is an annual ranking of countries compiled and published by Reporters Without Borders (RWB) based upon the organisation's own assessment of the countries' press freedom records in the previous year. It intends to reflect the degree of freedom that journalists, news organisations, and netizens have in each country, and the efforts made by authorities to respect this freedom. Reporters Without Borders is careful to note that the index only deals with press freedom and does not measure the quality of journalism nor does it look at human rights violations in general. • The report is partly based on a questionnaire which asks questions about pluralism, media independence, environment and self-censorship, legislative framework, transparency, and infrastructure. • The questionnaire takes account of the legal framework for the media and the level of independence of the public media. • It also includes violations of the free flow of information on the Internet. • Violence against journalists, netizens, and media assistants, including abuses attributable to the state, armed militias, clandestine organisations or pressure groups, are monitored by RSF staff during the year and are also part of the final score. • A smaller score on the report corresponds to greater freedom of the press as reported by the organisation. 1) Kambala is an annual Buffalo Race held traditionally under the sponsorship of local landlords. 2) Kambala takes place in the coastal region of Tamil Naidu. Kambala is traditionally a simple sport which essentially, to entertain rural people of the area. The 'track' used for Kambala is a slushy paddy field. The contest generally takes place between two pairs of buffaloes, each pair race in wet rice fields, controlled by a whip-lashing farmer. Historically, the winning pair of buffaloes was rewarded with coconuts and bananas. Today, gold coins, silver coins are given; in some competitions, cash award is also popular. Kambala is an annual Buffalo Race held traditionally under the sponsorship of local landlords and households, in coastal Karnataka, India. The Kambala season generally starts in November and lasts until March. Of late, Kambala Samithis are formed to arranged Kambala in a systematic way and 18 kambalas are being held under the banner of Kambala Samithi (Kambala Association). Currently, more than 45 races are held annually in Coastal Karnataka, including smaller remote villages like Vandaru, Gulvadi etc. 5. Which of the following Indian entity doesn’t have a GI Tag? GI is covered under the Intellectual Property Rights and the Trade Related Aspects of Intellectual Property Rights. A GI tag certifies the origin of a product or produces from a particular region of the quality or other features of the product are attributable only to the place of its origin. The tag helps farmers or manufacturers, as the case may be, to get a better price in the market. Recently, the succulent Banganapalle mango has received a Geographical Indication (GI) tag, making Andhra Pradesh the proprietor of the variety known for its sweetness. The Andhra Pradesh government is the registered proprietor of the GI tag for mangoes, often hailed as “the king of fruits.” A GI tag indicates that the product comes from a specific region. Banganapalle mangoes have been grown for over 100 years in the State. It also is known as Beneshan, Baneshan, Benishan, Chappatai and Safeda. Besides, they are also called Banaganapalli, Banginapalli, Banaganapalle. The fruits can retain their quality for cold storage even up to three months. The prominent characteristic of Banganapalle mangoes is that their skin has very light spots, the stone is oblong in shape and has very thin seed with sparse and soft fibre all over. The primary centre of origin of the fruit is Kurnool district comprising Banaganapalle, Paanyam and Nandyal mandals. 7. Which of the following statement is correct regarding the term,” Molecule Disarib”, recently seen in the news? 10. In which country is the “Men only Island or Okinoshima”, recently seen in news located? I. The project will develop an innovative pilot-scale plant, suitable to cope with Indian conditions in a location specific manner. II. The project Local Treatment of Urban Sewage Streams for Healthy Reuse (LOTUS HR) is an Indo-US joint project funded by Department of Biotechnology (DBT), Govt of India and NWO/STW, The Govt of USA. The project Local Treatment of Urban Sewage Streams for Healthy Reuse (LOTUS HR) is an Indo-Netherlands joint project funded by Department of Biotechnology (DBT), Govt of India and NWO/STW, The Govt of Netherlands. The project has stakeholders from both Academia and Industry from India and Netherlands. It is coordinated by Indian Institute of Technology (IIT), Delhi with participation of The Energy and Resources Institute (TERI), New Delhi and National Environment Research Institute, Nagpur from India while Technical University Delft is coordinating it from The Netherlands, with participation of Environmental Engineering and Water Technology Department, UNESCO, Wageningen University and its Aquatic Ecology Department. There is also a commitment from industry, especially from The Netherlands, in terms of both cash and kind towards the project. The project aims to demonstrate a novel holistic (waste) water management approach, that will produce clean water that can be reused for various proposes (e.g. industry, agriculture, construction etc. ), while simultaneously recovering nutrients and energy from the urban waste water, thus converting drain into profitable mines. Special attention will be paid to pathogen removal and removing conventional and emerging pollutants. I. The Liveability Standards of 140 cities including 53 cities with the population of one million and above and Smart Cities will be assessed. II. Cities will be assessed on 15 core parameters relating to Governance, social infrastructure pertaining to education, health and safety and security, economic aspects and physical infrastructures like housing, open spaces, land use, energy and water availability, solid waste management, pollution etc. III. The Ministry of Urban Development has come out with a detailed document on “Methodology for Collection and Computation of Liveability Standards in Cities” for the benefit of States and Cities. To start with, Liveability Standards of 140 cities including 53 cities with the population of one million and above and Smart Cities will be assessed. The Ministry has already invited bids for selecting the agency for carrying out the assessment based on the parameters evolved by the Ministry. The Ministry of Urban Development has come out with a detailed document on “Methodology for Collection and Computation of Liveability Standards in Cities” for the benefit of States and Cities. Cities will be assessed on 15 core parameters relating to Governance, social infrastructure pertaining to education, health and safety and security, economic aspects and physical infrastructures like housing, open spaces, land use, energy and water availability, solid waste management, pollution etc. Cities will be ranked based on Liveability Index that would cover a total of 79 aspects. I. UN-Habitat promotes socially and environmentally sustainable human settlements across the world. II. Since the UN-Habitat came into being in 1995, it is only the third time that India has been elected to lead this important organisation after 2007 and 2001. India has been unanimously elected as the President of the UN-Habitat, an organ of the United Nations’ Organisation (UNO) that promotes socially and environmentally sustainable human settlements across the world, after 10 years. UN-Habitat reports to the United Nations General Assembly. Since the UN-Habitat came into being in 1978, it is only the third time that India has been elected to lead this important organisation after 2007 and 1988. As an inter-governmental policy-making and decision-making body, the Governing Council of UN-Habitat seeks to promote an integral and comprehensive approach to human settlements, assist the countries and regions in addressing human settlement problems and strengthen cooperation among all countries on the human settlement issue. 14. Which of the following statements is correct regarding the Chinnar wildlife sanctuary recently seen in the news? 1) The Chinnar Wildlife Sanctuary (CWS) has started a project to rehabilitate Indian star tortoises seized from smugglers. 2) The CWS has become the only rehabilitation centre for star tortoises in the country. 3) The Western Ghats including all of Chinnar Wildlife Sanctuary is under consideration for selection as a World Heritage Site. An ambitious project of the Kerala Forest Department at the Chinnar Wildlife Sanctuary (CWS) to rehabilitate Indian star tortoises seized from smugglers has turned into a major success. This makes the CWS the only rehabilitation centre for star tortoises in the country. The CWS is the only place in Kerala where star tortoises are known to occur in the wild. The sanctuary is now a haven for at least 450 such tortoises seized from poachers in less than two years. The success of the programme is so overwhelming that the star tortoise has turned into an icon of the sanctuary. Chinnar Wildlife Sanctuary (CWS) is one of twelve wildlife sanctuaries among the protected areas of Kerala. The Western Ghats, Anamalai Sub-Cluster, including all of Chinnar Wildlife Sanctuary, is under consideration by the UNESCO World Heritage Committee for selection as a World Heritage Site. 2) UN-Habitat reports to the United Nations General Assembly. The UN-Habitat came into being in 1978. It is only the third time that India has been elected to lead this important organisation after 2007 and 1988. It is an inter-governmental policy-making and decision-making body, the Governing Council of UN-Habitat seeks to promote an integral and comprehensive approach to human settlements, assist the countries and regions in addressing human settlement problems and strengthen cooperation among all countries on the human settlement issue. 1) TISC program provides innovators in developing countries with access to locally based technology information. 3) The Cell for IPR Promotion and Management (CIPAM) is designated under the aegis of Ministry of Urban Development. WIPO’s Technology and Innovation Support Centers (TISC) program provides innovators in developing countries with access to locally based, high-quality technology information and related services, helping them to exploit their innovative potential and to create, protect, and manage their intellectual property (IP) rights. The Cell for IPR Promotion and Management (CIPAM) is designated as the National Focal point for the TISC national network. As the national focal point, CIPAM shall identify potential host institutions, assess their capacities and support them in joining the TISC project. CIPAM will also act as the main intermediary between WIPO and TISC host institutions and coordinate all the activities of the national TISC network. a. Ministry of Defence gave an operational strategy ‘SAMADHAN’ to terrorism. b. Ministry of Home affairs gave an operational strategy ‘SAMADHAN’ to fight Left Wing Extremism. c. Ministry of urban development launched an operational strategy ‘SAMADHAN’ as a part of the Swatch Bharat Abhiyan. The Home Ministry enunciated an operational strategy ‘SAMADHAN’ to fight Left Wing Extremism. The elements of this strategy are S for Smart Leadership, A for Aggressive Strategy, M for Motivation and Training, A for Actionable Intelligence, D for Dashboard-based Key Result Areas and Key Performance Indicators, H for Harnessing Technology, A for the Action Plan for Each Theatre and N for No access to Financing. 2) All 193 UN members are automatically parties to the Court's statute. 3) Non-UN members can never become parties to the Court's statute. The International Court of Justice is the primary judicial branch of the United Nations (UN). As stated in Article 93 of the UN Charter, all 193 UN members are automatically parties to the Court's statute. Non-UN members may also become parties to the Court's statute under the Article 93 (2) procedure. For example, before becoming a UN member state, Switzerland used this procedure in 1948 to become a party, and Nauru became a party in 1988. Once a state is a party to the Court's statute, it is entitled to participate in cases before the Court. However, being a party to the statute does not automatically give the Court jurisdiction over disputes involving those parties. The issue of jurisdiction is considered in the two types of ICJ cases: contentious issues and advisory opinions. 19. Recently, the 29th series of India-Indonesia CORPAT is scheduled in which of the following places of India? The 29th series of India–Indonesia CORPAT is scheduled from 09 – 25 May 2017 with the opening ceremony being conducted from 09 -12 May 17 at Port Blair under the aegis of Andaman and Nicobar Command. Apart from securing the trade sea route, the Coordinated Patrol also serves to enhance mutual understanding and interoperability between the two navies. The CORPAT thus reflects the shared concerns between the two countries in the peaceful Indian Ocean for the benefit of the international community. 20. Indian researcher’s developing a variety of which of the following fruits that will be resistant to wilt disease called ‘Fusarium’? Recently, the scientists of National Research Centre for Banana (NRCB) will work on developing a banana variety which is resistant to wilt disease. The NRCB is part of four major institutes across the country working on the project and this batch, in turn, would work with 15 other countries in this regard. The wilt disease called ‘Fusarium’ causes extensive damage to banana and it has been a global challenge to evolve a variety resistant to it. In many African countries, where banana is a staple food, the incidence of wilt means a major setback to food production. I. The recently launched Pradhan Mantri Ujjwala Yojana has benefited 1.98 crore BPL households so far. II. The rural electrification programme is proceeding swiftly, with over 13,000 villages electrified out of a total of 18,452, and is on track for completion within the targeted 1000 days. III. Under Pradhan Mantri Awas Yojana, over 32 lakh houses have been completed in rural areas in FY17. The Prime Minister, Narendra Modi, on 9th May 2017, reviewed the progress of key infrastructure sectors including petroleum and natural gas, power, renewable energy and housing. The review meeting, which came soon after the review of connectivity-related infrastructure sectors in the last week of April, lasted for about three hours and was attended by top officials from PMO, NITI Aayog and all infrastructure Ministries of the Government of India. • The Pradhan Mantri Ujjwala Yojana has benefited 1.98 crore BPL households so far. • The contribution of gas to the primary energy mix has risen to 8%. 81 cities are being covered under City Gas Distribution networks. • The rural electrification programme is proceeding swiftly, with over 13,000 villages electrified out of a total of 18,452, and is on track for completion within the targeted 1000 days. • Over 22 lakh rural BPL households were electrified in 2016-17, and over 40 crore LED bulbs were distributed in the same period. • The total inter-regional transmission capacity has been significantly enhanced, with 41 GigaWatts transmission capacity being added from May 2014 to April 2017. • The total renewable generation capacity has crossed 57 GigaWatts, with an increase of 24.5% being registered in the last fiscal year. • The capacity addition in solar energy in FY17 was the highest-ever, at 81%. • Solar and wind tariffs have now achieved grid parity, with rates well below 4 rupees per Kilowatt-Hour. 22. Recently, one of the reputed US based international media houses in the latest issue of its publication ‘Condé Nast Traveller’ has listed the river cruise on which of the following Indian rivers as one of the ‘six river cruises to take in 2017’? A reputed US based international media house in the latest issue of its publication ‘Condé Nast Traveller’ has listed the river cruise on Ganga as one of the ‘six river cruises to take in 2017’. The media house has placed the luxury cruise vessel Ganges Voyager II which sails on the Ganga from Kolkata to Varanasi, in the league of cruises on Mekong and Yangtze in China, Amazon in South America, the Volga in Russia and Irrawaddy in Myanmar. Conde Nast’s endorsement of Ganga as a cruise destination is a shot in the arm for river tourism in the country. The Inland Waterways Authority of India facilitates cruise operations on NW-1 (river Ganga) from Kolkata to Varanasi in collaboration with private cruise operators. The facilities provided by IWAI include navigation aids including night navigation facility, embarking and disembarking at designated locations, facilitating expeditious crossing of Farakka Navigation Lock, pilotage, and assistance in distress. I. On May 1, 2017, it was approved that the initiative be extended to 100 villages in the vicinity of the initially selected five villages of Haryana. II. A large number of projects have been undertaken in the initially selected five villages of Haryana under the SMARTGRAM initiative in the fields of agriculture, skill development, energy, education, heath, employment generation, developing entrepreneurship etc. The SMARTGRAM initiative of Rashtrapati Bhavan was inaugurated for five villages of Haryana i.e. Tajnagar, Dhaula, Alipur, Harchandpur and Rojka Meo by the President of India, Pranab Mukherjee on July 2, 2016. On May 1, 2017, it was approved that the initiative be extended to 100 villages in the vicinity of the initially selected five villages of Haryana. A meeting with people’s representative from 100 villages now included under the SMARTGRAM initiative and selected stakeholders on the expansion of SMARTGRAM initiative was taken by the Secretary to the President, Omita Paul at Rashtrapati Bhavan. The aim of the meeting was to sensitise them on the initiative and discuss plans for implementation of various programmes in these villages. A large number of projects have been undertaken in the initially selected five villages of Haryana under the SMARTGRAM initiative in the fields of agriculture, skill development, energy, education, heath, employment generation, developing entrepreneurship etc. These initiatives have generated a lot of enthusiasm in the nearby areas. Therefore, this initiative was extended to 95 more villages in the vicinity of the earlier selected five villages taking the total number of villages under the SMARTGRAM initiative to 100. 24. A unique underground water management structure of the Mughal era known as the ‘Khooni Bhandara,’ is eyeing the tag of UNESCO world heritage site located in which of the following states of India? A unique underground water management structure of the Mughal era in Madhya Pradesh, known as the ‘Khooni Bhandara,’ is eyeing the tag of UNESCO world heritage site. A proposal in this regard will be sent to the Union government. Khooni Bhandara is a network of Kundis (well-like structures), which are interconnected through an underground tunnel. The system ensured a smooth course of water from the first to the last Kundi, based on the law of gravity. An iron stairs or rope is used to go down in the tunnel through these well-like structures. These structures were developed during the Mughal era for water supply. The structure, also a popular tourist spot is still functional and serves high-quality drinking water to a portion of Burhanpur. 25. Four postgraduate students of which of the following country have developed a ‘lunar palace’ on earth in a laboratory simulating a lunar-like environment for up to 200 days? Chinese students will live in a laboratory simulating a lunar-like environment for up to 200 days as Beijing prepares for its long-term goal of putting humans on the moon. Four postgraduate students from the capital’s astronautics research university Beihang entered the 160-square-metre (1,720-square-foot) cabin — dubbed the “Yuegong-1”, or “Lunar Palace”. The volunteers will live in the sealed lab to simulate a long-term, self-contained space mission with no input from the outside world, Xinhua, a news agency said. Human waste will be treated with a bio-fermentation process, and experimental crops and vegetables are grown with the help of food and waste by-products.